Can You Pair Cheese and Sake? When in doubt about what wine to pair with a meal, often the adage “What grows together goes together” supplies an acceptable approach. Serve a wine indigenous to the region your dish hails from and you will at least have a pairing that has long been a convention. It is better to be accused of being conventional than wrong I suppose. But rules are made to be broken according to another adage. Sometimes the best pairing has nothing to do with what grows together. Although contemporary Japanese eat cheese as snacks or on pizza, it isn’t incorporated into traditional Japanese cuisine. Yet sake and cheese can make an excellent pairing at least in theory. 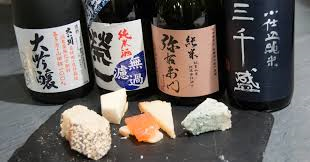 The fermentation process that Sake undergoes creates lactic acid which of course is also a main component of cheese. The lactic acid contributes to the aromas and flavors in cheese as well as the creamy texture and yogurt-like aromas in Sake. And both aged cheeses and Sake are high in umami. According to flavor pairing theory, foods that share flavor molecules will harmonize well. So this should work. The nutty, salty flavors of the cheese and the dry mouth feel complemented the soft, full bodied Sake that emphasized fruity notes mostly by staying out of the way of each other and creating balance in the mouth. A good but not extraordinary pairing. This is a gentle Sake, very light weight and fruity. The Gruyere’s developing earthiness was subtle and needed a sake that was not too assertive but with enough fruity quality to match the sweetness of the cheese. This was a perfect pairing perhaps the best in this lineup. The sake showed complex green apple and peach on the nose, quite pronounced and juicy. Creamy and full on the palate and loaded with umami with with plenty of acid to balance the weight. It all melded perfectly with the blue cheese. The flavors in the sake were assertive enough to stand up to the cheese yet on the palate it was all melding and integrated. Another great match. A funky nose, lots of mushroom and earth with a buttery mouthfeel and quite a bit of sweetness on the palate. The havarti was young and the buttery mouthfeel matched that of the sake but I thought the earthy notes in the sake were fighting the cheese and burying its flavors. This sake is best with meat or fermented fish. It needs strongly flavored food. Yes, they make a sparkling sake which tastes like Moscato, light, fruity, and refreshing. It was fine with the nutty, slightly tangy flavors of the cheese but there wasn’t much synergy. OK but not remarkable. Assertive sweetness with coconut notes and a slight smoky quality for this Sake. It was fine with the Brie because Brie is so mild it won’t fight other flavors. The problem with Brie is that it coats the mouth making it harder to taste the flavors in the beverage you pair it with. I thought it perhaps dulled the flavor of the sake a bit but otherwise the pairing work. Mr. Ueno advised against pairing sake with goat cheese or Camembert I have no first hand experience with those pairings. So in conclusion, in general sake and cheese pair nicely when done thoughtfully. For beverage and food pairing enthusiasts there is much here to explore; it’s worth adding to your list of more and more things to learn. Spring is just around the corner. 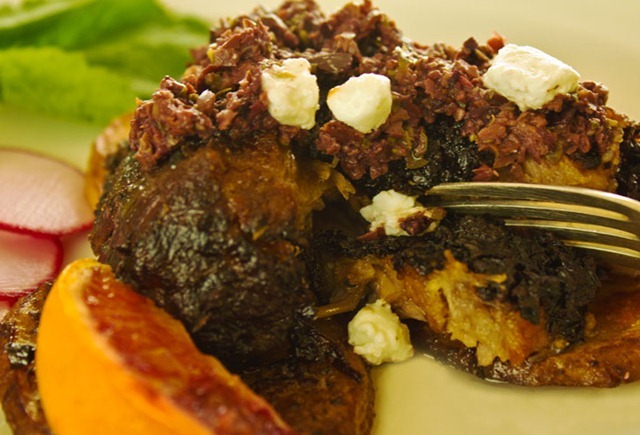 Even if you’re socked in with snow, this dish will give you hope. Gargouillou is a classic dish of potatoes and ham indigenous to Aubrac, a town in Central France. But in the early 2000’s it was reinvented by renowned French chef Michel Bras as a celebration of garden fresh vegetables. His Gargouillou (pronounced gar-gu-yu) is a salad consisting of 60 individually prepared vegetables, flowers, and seeds that vary depending on what is fresh. My version does not have 60 ingredients (only 12). My purpose is to continue testing “flavor pairing theory”, the theory that foods that share flavor compounds go well together. (The idea for the gargouillou was suggested by François Chartier, among others, in his book that defends this theory) Thus, I have included in this recipe, for the most part, only ingredients that share anise-flavored molecules. 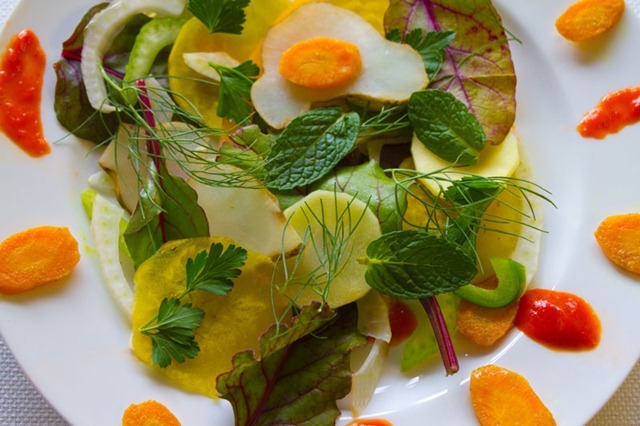 The salad consists of fresh fennel, celery, parsnips, yellow beets, curried carrots, Jerusalem artichokes, mint, and parsley, all of which share the anise flavor. I threw in some green and yellow bell pepper, cucumbers, baby beet greens, and red pepper puree for color and contrast. I’ve put this theory to the test elsewhere (here and here) with mixed results. My conclusion in this case is mixed as well. The parsnips, gently steamed in licorice water, complimented everything on the plate, as did the curried carrots, and raw fennel. The sweetness of the beets (also lightly steamed) overwhelmed anything they were paired with. They are more subtle and compliment the other flavors when served raw and very thinly sliced. The mint’s intensity was overpowering but seemed connected to the other ingredients as well. Jerusalem artichokes taste faintly of licorice when raw, even less so when cooked. Their more prominent nutty flavor seemed quite distant from the other flavors on the dish although the combination was pleasant. The parsley and celery are outliers. They have subtle licorice notes but both are overwhelmingly grassy and bitter. They provide contrast and tension, not compatibility. Chartier’s wine recommendation was spot on. Salads are notoriously hard to pair with wines. But Sauvignon Blanc shares the anise note and really enhanced this dish. (1) It doesn’t take into account the relative amounts of a flavor compound when predicting the compatibility of flavors. (2) It doesn’t take into consideration the fact that an ingredient has a mixture of flavor compounds, some of which may provide contrast and tension rather than compatibility. (3) And a conceptual issue. I’m not at all clear on what advocates of the theory mean by “pairs well” or “goes together”. There are different ways of “going together”. Flavors that don’t clash, flavors that merge, produce synergy by enhancing each other, that are separate but complimentary, or provide an interesting contrast are all ways of “going together”. Which is intended by the theory? Each possible interpretation of “going together” is represented in the gargouillou. (4) And a theoretical consideration. Balance is essential in a dish. But if so, don’t we sometimes want contrasting flavors that build tension rather than “go together”?